I’m quite confident that the first response would be to answer on behalf of the academic advisor. The next step would probably be to the career advisor, depending on the terminology used on your campus. However, the identity of the student organization advisor may not make the immediate list. We could talk for a while about why that is, but my first thought is that it happens because the work of the student organization advisor takes place largely after 5:00 p.m., on weekends, and sometimes during “free time” that a generous person contributes toward supporting students. I think [advising programming board] is my favorite teaching opportunity. I associate teaching with making a connection. Maybe I’m not giving them specific philosophy or theory or practices, but I’m learning about them. Through learning about them, I can teach them different perspectives, and I can teach myself a lot at the same time. The National Academic Advising Association takes this message of “Advising as Teaching” and explores it thoroughly in this great resource. Our professional associations in campus activities DO support dialogue about advising practices in venues like professional conferences, but the role of “advisor” is not just taken on by the campus activities professional. It’s the biology faculty member who advises the Biology Club, it’s the Resident Director who advises the Residence Hall Association, and the Assistant Director of Alumni Relations who advises the Senior Class Committee too. These folks are working daily with students and play a key role in the student learning experience. 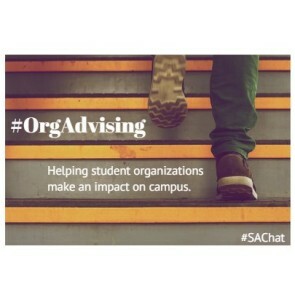 Is student organization advising a teaching role? Is it a risk management/in loco parentis role? Is it both? How do we know? The answer can’t only be “bring all of those people to a conference” or “have the activities office develop an advisor program.” The challenges are deeper than that, especially given the dialogue about the student organization advisor role is largely disconnected from other advising activities on campus and may not be reaching as large an audience as it could in the discussion of student learning. We’ll change that this month on the Student Affairs Collective! The discussion of the work of the student organization advisor will be coming front-and-center as colleagues contribute their thoughts on the role of the student organization advisor on our campuses. Your student affairs colleagues are writing about a wonderfully diverse range of topics this month that will explore various aspects of the advisor’s role and I’m really looking forward to some food for thought to help sustain colleagues through a busy time of year.